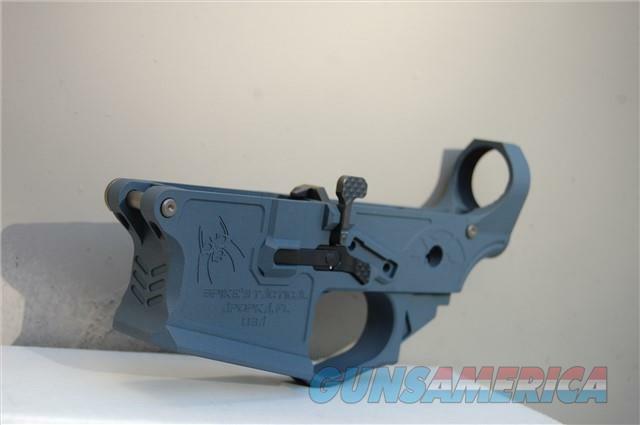 Description: New in box Spikes Tactical Gen II Billet lower receiver X-Werks cerakoted in Kobalt Kinetic Slate! From Spikes: The Gen II billet lower receiver comes with the following components already installed to make your life easier: Titanium pivot pin, detent, and spring Titanium take down pin, detent, spring, and 4-40 set screw KNS Gen 2 Mod ST anti-rotation trigger and hammer pins Spike's Tactical 90* ambi safety selector Enhanced bolt catch Ambi bolt release paddle Bolt catch spring Bolt catch plunger Ambi bolt release cross pin Threaded stainless steel pin for bolt catch Threaded stainless steel pin for ambi bolt release paddle Ambi magazine release paddle Magazine catch Magazine catch spring Billet magazine catch button Set screw for adjustable trigger reset Nylon tip set screw for upper to lower tension 2 short set screws to lock adjustable Please allow 1-3 business days for items to ship once payment and FFL are received. Follow X-Werks on Facebook to see NEW product updates!!! Go to -werks.com for more info!! Stop by our shop, give us a call, or email us with any questions! As always, NO CREDIT CARD FEES! !.